A brilliant and refreshing new take on backgammon sets! This fabulous backgammon set is highly regarded for its unique design, fabulous color pattern, and it’s beautiful beech wood inlaid board. The set includes wood chips and cups. This beautiful and elegant backgammon set is made out of the finest walnut woods. 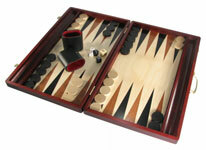 This handsome backgammon set features a 14.5” x 10” board, and includes all game pieces. An elegant set for a terrific price! BG502-62512. Folding Wood Backgammon Set. This stunning wood backgammon set is perfect for postable game play. Crafted from the finest sheesham woods, this wonderful looking set features a magnetic playing field (great for travel). Includes wood chips, dice and doubling cube. The set measures 12” x 7” x 1.5” when closed. Looking for a stunning and practical game set? This sheesham wood backgammon combination set includes three of your favorite games Backgammon, Chess, and Checkers. All game pieces are included. This fabulous set is a fresh new take on the classic backgammon set. The set features an elegant wood attaché with drawer and matching checkers. It measures 19-3/8” x 15”x 1”. Our deluxe walnut backgammon with attention to detail features a unique design with a smooth playing field. The set includes coordinated backgammon pieces. This stunning backgammon set is made out of the finest woods and features a stylish case with a dark Wood playing field interior. The set includes chips, cups, dice and doubling cube. The set measures 22-1/2"x 18" with checkers 1-3/8" x 3/8". A truly unique and handsome set! You will adore the craftsmanship and design of this 15” black and red wood backgammon set. The set features a natural wood exterior with coordinated game pieces. The set measures 15" x 18-1/2" x 2". This handsome inlaid oak wood set equipped with solid brass latches and a carrying handle offers three different games all combined into one exciting package. This Combination Set has all you need to play chess, backgammon, and checkers. Inside the carrying case there is plenty of space for storage of game pieces. The set includes 32 weighted and felted chessmen with a 3” King, wooden checkers, 2 leather dice cups, 4 dice, and doublers. The set measurements when closed are 15” x 10”. A fabulous item with a practical fold away design at a very reasonable price! A truly unique set that features a wooden case with an artistic inlaid on the playing field. The set measures 23-1/2”X 19" and includes all game pieces. BG505-2319. Premium, Green Sorrento Backgammon Set. This classy and elegant backgammon set is hand crafted in Italy from the finest woods and is finished in 16 layers of lacquer. This gorgeous set includes matching solid wood game pieces, solid brass hardware and a lock and key set. The set measures 23 ¼” x 19 ¾” 1 ½” (open). BG504-2620. Premium, Blue Sorrento Backgammon Set. The elegance of the Sorrento is unmistakable. This handsome attaché style set is one of a kind, crafted by Italian Artisans from the finest quality woods. An exotic item that features solid brass hardware with lock and key set. The set includes all game pieces.